History can be an intimating arena. In every slice of time there is more to study than time itself allows. So too it is with the history of the Christian Church. There are bountiful histories on the doctrines, theologians, liturgies, writings and controversies of the church. And for most laymen and even some pastors, these resources remain an intimidating arena to step into and explore. In an effort to combat this general lack of knowledge, Justin Holcomb has started a new “Know” series seeking to present church history at the level of the standard laymen. 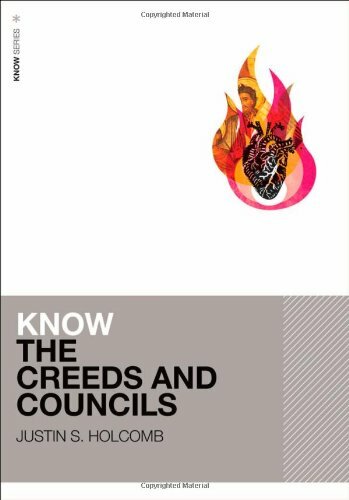 Know the Creeds and Councils (hence referred to as Creeds and Councils) seeks to provide the pertinent information about the great confessional moments in church history. In every aspect Creeds and Councils is written for laymen. Purposefully laid out for Bible studies, Sunday School and other group studies (12), the chapters are self-contained and present all the materials relevant for each respective creed or council. Throughout Creeds and Councils Holcomb uses down to earth language and clear descriptions of the many historical issues that are covered during the church’s history. Though Creeds and Councils is unable to cover all the creeds, catechisms and councils of church history, its attempt is valiant and marginally successful. In relatively few pages, Holcomb is able to cover all of the important ecumenical councils (chapters 1-7), the great Reformed creeds (chapters 9-11) and even a recap of recent modern activity (chapters 12-13). The glaring absence however is the Lutheran tradition. Setting this major problem aside for now, the content in each chapter is spectacular. Holcomb profitably presents the historical setting, content and modern relevance for each creed and council covered. This is no small task and permits the Creeds and Councils to be strong in its application to the modern believer. The sections covering the Council of Ephesus (chapter 3), Councils of Carthage and Orange (chapter 7), and Thirty-nine Articles of Religion (chapter 10) stand out in their detail and application. Likewise, the sections dealing with Catholic councils (chapters 8 and 12) are incredibly valuable for modern Protestant. Despite (perhaps because of) these beneficial chapters the neglect of any chapters dedicated to the Lutheran confessions is stunning. Though they are mentioned briefly in the introduction (15), there are no serious mentions except scant references in the form of distinctions to the Heidelberg Catechism (chapter 9). The neglecting of this important Protestant tradition is a serious shortcoming and unacceptable given the chapter on modern documents with significantly less relevance (chapter 13). Creeds and Councils is an important resource for laymen seeking to learn about the doctrinal and practical relevance of church documents throughout the ages. On the councils, creeds and confessions that it covers the book is outstanding and worthy of use for both groups and individuals. However, the lack of specific attention to the Lutheran tradition makes this a severely flawed book. Though the book’s value remains, it cannot be a final and long standing resource for serious Protestant laymen or pastors.